Home cleaning supplies prove to be expensive, toxic and as the packaging gets more pretty, the bottles seem to hold less and less… Unfortunately the prices don’t go down when less is offered. Times are tight and we need bigger bang for our dollars. Here’s a solution that will save you money, effort in scrubbing and you will have shiny surfaces once again. Daniel and I enamel painted our bathtub. We found that regular household cleaners were affecting the surface of the tub. After we had enameled the tub, we needed to find a solution to clean the tub but not wreck the new paint job. In our research we discovered that we can make our own cleaning solution that wouldn’t be harmful to our tub, toilets, sinks and etc in the bathroom. Spray onto your tub, toilet, tiles. Sorry ladies, this scum remover is only for bathrooms. If you have other scum problems, change the locks on your house and crack open a bottle of wine! Let sit on the surface for about 20 – 30 minutes. You will notice there is a strong natural smell. It’s caused by the vinegar. Vinegar kills most mould, bacteria and germs. It’s environmental friendly too! Put on your dish mitts to scrub. The vinegar is tough on your skin. Makes my hands wrinkly at the end. Take a non-abrasive scrubby and wipe down the surface. The scum will be little effort to remove. You may be smiling while scrubbing your tub but I think that happens more on commercials and isn’t realistic. Rinse the surface and you are good to go. Enjoy your new cleaning product. It really does work wonders and we use it all the time! 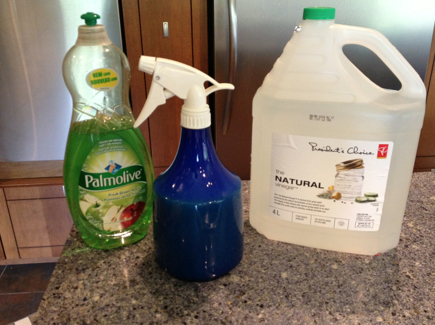 This entry was posted in Advice & Tips and tagged Bathroom, clean, Cleaning agent, Cleaning Solution, Cleanliness, crochet crowd, Dishwashing liquid, Home, Mikey, Mix, Recipe, Remedy, Surface, Vinegar. Bookmark the permalink. im a packrat, if you save bleach 1 gallon bottles and rince them very throughly, you can make a gallon of solution at a time then just refill spray bottles as needed. I use vinegar too! Eco-friendly and cheaper than industrial products which are very strong too. Thanks! It really does work and works better than I could have thought. This is awesome! Thank you so much for this. I just had a severe cut in income and this will be a great help for me. I will add one suggestion. If you spray the solution on your tub every other time you use it, there will be no scrubbing necessary. Just a quick wipe down with a sponge after a few minutes. Really it takes so little time and a sparkly clean tub everytime you get in is so welcome. Mostly, the time it takes is so little and the elbow grease you save is worth it. 🙂 I spray my tub and surround everytime I get out, it sits while I dry off and apply lotion. Then I rinse with a sprayer and never need to wipe or scrub. Tub is clean all the time. This is a great idea! I have a toilet that needs scrubbing (kid bathroom, three young boys, yikes!) and nothing that I have tried gets rid of the gunk without damaging the surface. I will give this a try. Thanks! Mikey, I have laughed and cried more with you than most of my best friends. You did it again. I am rolling on the laugh, tears rolling. You just made my week………….. Step #1………..
How I wish I lived closer to you and Diva Dan.